Dietz - Made from Brass or Tin, Dietz Deck lanterns are marked with the distinctive oval "Dietz" logo on the top of the lid. They don't have the broad rounded cage that the Dietz Dark lanterns have, instead they have the straight "squared-off" cage. All Dietz Deck lanterns seem to have the tie downs on their bellbottom base The Tin version is much more common than the Brass version. Both versions used the "Dietz Convex" burner. Some of the "Brass" versions are found with a "Simplex" burner from the E. Miller Co. See the Fount/Burner Page for additional detailed photos of Dietz lantern parts. Keystoneware - Made of Tin, these lanterns are of solid construction and are finely stamped on the top of the lid with a Key and the letter "K" inside a Keystone shape. The word "Keystoneware" is stamped in an arch above the symbol. See their logo in the lid photo above. They have the straight "squared-off" cage and use burners marked "Simplex" from the E. Miller Co.
Perkins - Manufactured out of Brass, I have yet to document a tin version. The lanterns shown in the photos above (center section), have either a oval brass or a rectangular Manufacturers tag attached to their side or base. The oval tag has the original 1922 "Perko" symbol stamped into the tag. 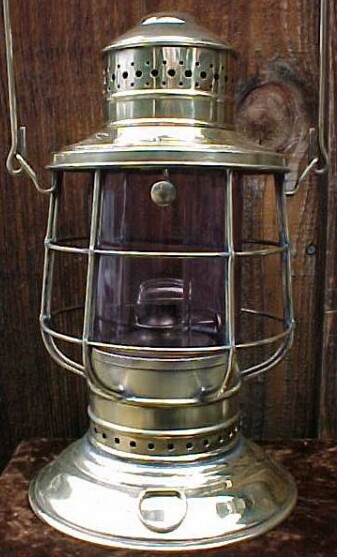 The Perkins lantern shown above (right side section) does not have a brass tag. Instead, it has the "Perko" symbol stamped directly onto the lower rim of the lid. 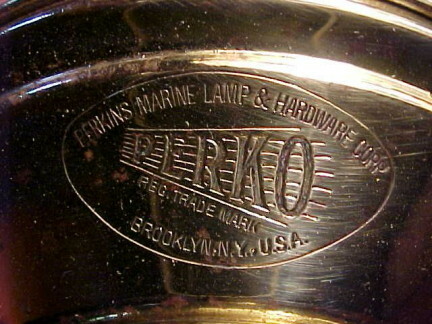 This lantern is interesting because this version of "Perko" stamping is also marked "Perkins Marine Lamp & Hardware Company". The Perkins Marine Lamp Company didn't change their name to include "Lamp & Hardware" until 1932.... after WWI. This lantern also has different construction than that of other Perkins marked lanterns. It has a curled ledge on the outside of the bellbottom. 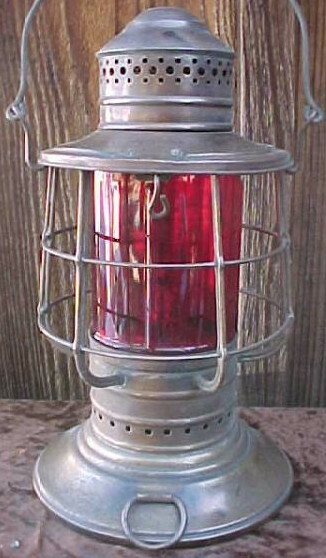 This lantern also has a bayonet style of fount... that doesn't match the standard sangster pinch type fount used in all the other manufacturers' Deck and Dark lanterns. Please see the Fount/Burner Page for photos of the differences in the Founts. The lanterns with the rectangular tag all appear original... all others with the oval tag (specifically those marked "Lamp & Hardware") appear to be reproduction or were marked at a later date. Universal Metal Spinning & Stamping Co. - Constructed from Brass only, these lanterns are often mistaken for railroad lanterns. This is probably due to the fact that once the rare ribbed globe breaks, a standard 5 3/8" railroad globe is often used for a replacement. These lanterns also are made without tie-down rings on their base which is another characteristic of a railroad lantern. As seen in the photo above, the company name is stamped on the lower rim of the lid. These lanterns are constructed with the standard straight "squared-off" cage. As with all Brass lanterns, the Universal lanterns are frequently found with stress cracks in two places.... the vertical section just below the globe and on the sides of the fount. It is rare to find them with no stress cracks. Generally a Universal lantern used a "Vortex" burner on its fount. Lafayette Metal - USUALLY made from Brass, this companies Deck lantern was only marked on the bottom of the fount. This can make identification difficult if the lantern is found without a fount or if another manufacturers fount is being used. The bottom photo shows a RARE " Brass & Tin " model. The top, vertical cage bars, bail, and fount are all brass with the remainder of this lantern being made from tin. A Dark lantern version of this lantern has not been documented to exist by this manufacturer. More sturdy than the Universal lanterns above, they are susceptible to stress cracks on the vertical section just below the globe. These lanterns are generally found with a burner from the P&A Manufacturing Co.
Wm. 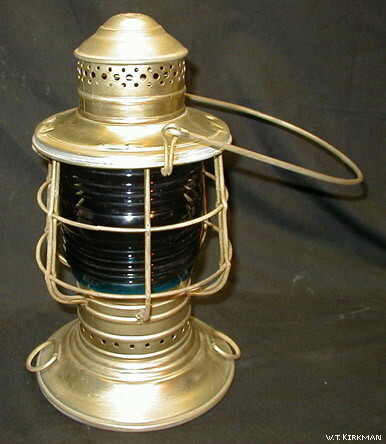 Stegmueller & Co. - Made from Brass or Tin, this version of Deck lantern usually has tie-down rings. And like the Lafayette Metal lantern, they are also identified by a stamp on the bottom of the fount. These are stamped "Wm. Stegmueller & Co. Philadelphia PA". Some- times they are stamped on the brim of the lid as well. These lanterns are usually found with a burner from the P&A Manufacturing Co. (see the Burner/Fount Page for detailed photos). Unknown manufacturer - Made of Brass, this lantern is unique in that the cage that protects the globe is made from flat stamped pieces of metal. On all other Deck and Dark lanterns... the cage is a double-wire guard construction. 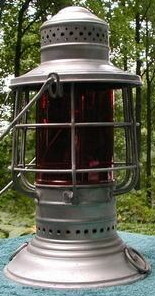 This lantern also has a loop in the bail which is also not characteristic of a Deck lantern. This could possibly be a reproduction, but that would only be a guess. If anyone has any additional information on this lantern... please contact us. Thanks! Back to HOME If there is any information or photographs you would like to include or display on this webpage... please feel free to email us at darklanterns@yahoo.com. Comments and suggestions are also welcome.